So you’ve discovered that you’re riding a credit card float. Sure, it’s a bummer but it’s not all bad news. In fact, to point out the obvious: the only thing that has changed is your level of awareness. Before: I pay my credit card(s) in full every month and never incur interest charges or fees. What could possibly go wrong? Now: Ack! I’m borrowing against my next paycheck to pay for current expenses. Awareness, my friends, is half the battle. The next step is to get off the credit card float. The following tutorial details exactly how to set up your accounts and the steps to follow each month until you get off the float. This tutorial is for users of the new You Need A Budget (YNAB) web-based subscription software (sometimes referred to as nYNAB). I’ll be following up with a tutorial for YNAB4 users soon. The idea is the same but the setup is different. Let me know if you have questions. If this tutorial is helpful, a kind word in the comments would not go amiss. First: I recommend beginning with a fresh, clean budget. That will be the quickest, easiest, and cleanest way to get started and move forward. However, if you are deeply invested in your existing data, you can introduce a FLTS without starting fresh but it requires extra steps and can prove to be messy. Skip to the end of this tutorial for instructions on how to integrate your existing data into the FLTS method. Second: This tutorial focuses on how to set up a FLTS while skimming (or even skipping) over general nYNAB skills and knowledge. The YNAB developers have provided their own resources explaining the YNAB methodology and the software. The Float Loan to Self [FLTS] methodology, for both YNAB versions, is my own work developed to better serve my clients. Create a new account. Skip the process of connecting with your bank (see screenshot 1a). You will be able to connect later if you choose to do so. Name the account. Choose a name that makes sense to you, i.e. Chase checking, Public Service CU checking, Citibank Visa, Amex 0082. Choose Checking as the Account Type (see screenshot 1b). Yes, choose checking even for your credit card(s). This setting will not keep you from connecting your credit card to your bank later. When creating checking accounts, you can enter a starting balance now or wait until Step 2. When creating credit card accounts, wait until Step 2 to enter a starting balance. When creating the FLTS account, wait until Step 3 to enter a starting balance. Repeat the account creation process for each checking account. Repeat the account creation process for each credit card account — as long as each one is paid in full [PIF] every month and never incurs interest charges. Create one last account. Name this one CC FLTS (see screenshot 1c). Even if you have multiple PIF credit cards, you will only need one FLTS account. Log into your bank account(s) and retrieve your current account balance(s). Edit each account’s Starting Balance transaction accordingly. Checking and savings account balances will be entered as an Inflow. Credit card outstanding balances will be entered as an Outflow (see screenshot 3). Now your assets (checking) and liabilities (credit card outstanding balances) are both entered. Click on the Budget tab to view your adjusted To Be Budgeted [TBB] balance (see screenshot 4). This number represents your actual cash available to pay for all upcoming expenses. Because you are riding a credit card float, this balance isn’t sufficient. The next step creates the money you need available in your To Be Budgeted balance in order to continue paying your credit card statement balances in full and avoiding interest charges. If you have a single PIF credit card, this is simple… note the outstanding balance of your account. If you have multiple PIF credit cards, total the outstanding balances. Enter the total of your outstanding credit card account balances as an Inflow in the Starting Balance transaction in your CC FLTS account (see screenshot 5). As in Step 3, click on the Budget tab. 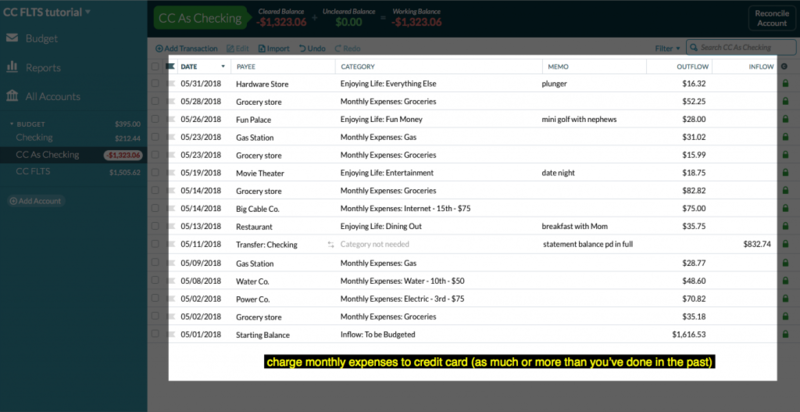 Your To Be Budgeted [TBB] balance should now equal the amount in your checking account (or, if you have more than one, the sum of all your checking accounts) (see screenshot 6). Create a new budget category/envelope. Name this new category Debt Reduction, FLTS Payments, or something similar. Assign this new category to any Category Group that makes sense to you but make sure it doesn’t get lost at the bottom of your budget where you’ll forget about it. Now we pick up with the normal flow of the budgeting process in YNAB. Follow YNAB’s Rule 1 and Give every dollar a job by budgeting your TBB balance to $0 (see screenshot 8). If possible, allocate funds to your new Debt Reduction category (see screenshot 9). Remember, you’re trying to get out of debt (get off the float). The only way to do that is to trim back on expenses. However, …. The key here is to avoid making promises to yourself you cannot keep. Don’t put yourself in a position of having to reduce your Debt Reduction allocation. It is better to under-promise and over-deliver. In Step 9, you will get the chance to add to your allocation and accelerate your progress toward debt reduction. At this point, it’s business as usual. Continue to charge your everyday expenses to your credit card and log your purchases/expenses as they happen. 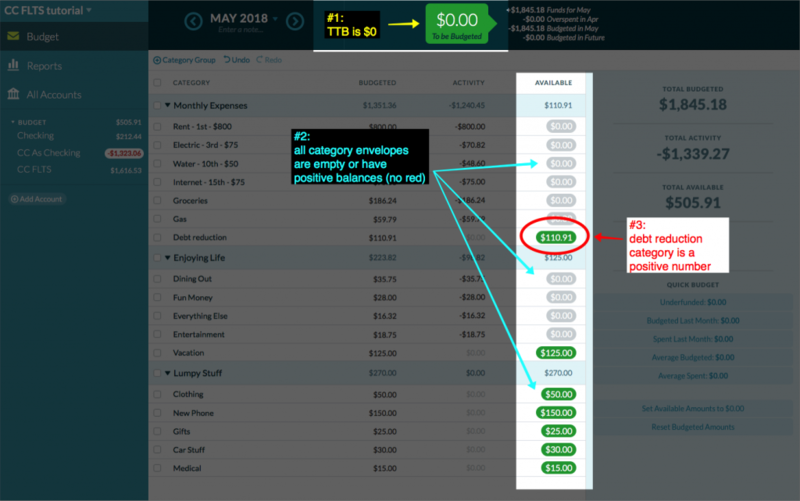 Important Point 1: as is standard practice in YNAB, make sure to cover any and all overspending immediately by moving money from a discretionary category to cover the overspend. Important Point 2: it is important to continue to charge expenses to your credit card(s) because you still need to float yourself that loan. If you were stop using your credit card and begin paying with cash instead, you’d overdraft your checking account. This step can be done at the end of each pay period or at the end of the month — whatever makes the most sense to you and works best with your income and expense cycle. The key here is to make sure that the funds you’re harvesting will not be needed to supplement your next paycheck-and-expenses cycle. Make sure all of your accounts are reconciled (no missing transactions) before completing the harvesting process. Identify a discretionary category that still has a positive Available balance that you do not need to roll forward to next month. Click on the Available balance (green bubble) and use the popup tool to move some or all of the leftover funds to your Debt Reduction category (see screenshot 11). Repeat the above, harvesting as many unused discretionary dollars as you can, sending them to Debt Reduction. Confirm that your TBB is still $0 (see #1 screenshot 12). Confirm that every category/envelope is either empty or has a positive Available balance (see #2 screenshot 12). Confirm that your Debt Reduction category has a positive Available balance (see #3 screenshot 12). This step is administrative only; no money is actually changing hands or being physically moved. As in Step 9, this process can be completed at the end of each pay period or at the end of each month — whatever makes the most sense in your particular situation. In your CC FLTS account register, create a new transaction (see screenshot 13). The Payee field can be left blank. In the Category field, choose your Debt Reduction category. Return to the Budget screen. Your Debt Reduction category envelope should now be empty (the bubble is gray). Your CC FLTS account balance should be lower. At any point, you can click on the dollar value in the Activity column to view of list of the transaction(s) applied to your FLTS during a particular month (see screenshot 15). Keep repeating Steps 7 – 12 until the balance of your CC FLTS account is at $0. Depending on the size of the float you are riding and the amount of trimming you can do from your monthly expenditures, this process can take anywhere from 2 months to 2+ years. Once you are done paying off your float, you can take these same budgeting principles and apply them to saving up and building buffer funds so you never find yourself riding the float again. As mentioned earlier, it is possible to integrate my FLTS method into an existing nYNAB budget without having to do a Fresh Start and give up all of your existing budget history. However, be forewarned: one mis-step and things could get messy fast. Complete Step 1 as described. Create new accounts just as instructed for each PIF credit card. These new accounts will replace any existing accounts you’ve already created for your credit cards. They must be converted to Checking accounts to circumvent the screwy programming YNAB has built into their credit card account type. Complete Step 4 – make a CC FLTS account. 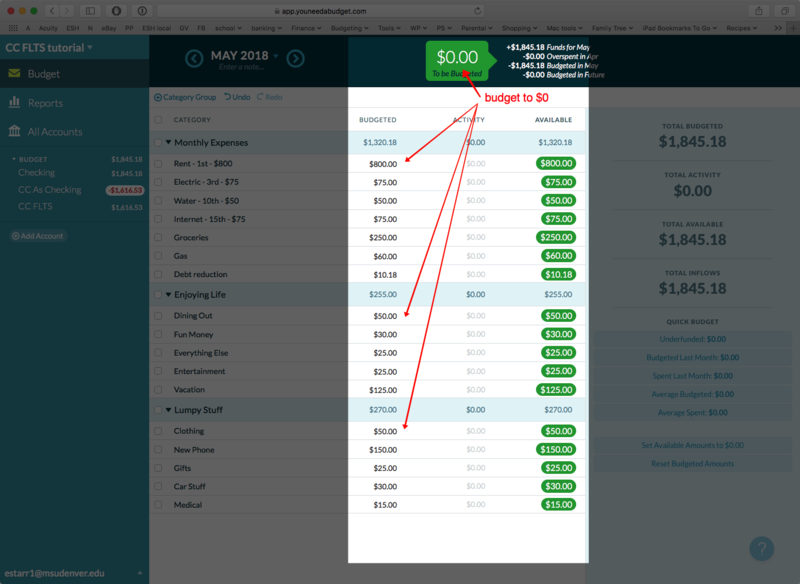 Complete Step 6 – create a Debt Reduction budget category. In the account register, select all transactions. Using the edit function, move every transaction from your old account to the corresponding new account. Once the old account is empty of all transactions, delete it. Fix account names — YNAB won’t allow two accounts with the same names so you likely had to give the new accounts temporary names. Confirm your work by checking your TTB balance and reconciling your credit card accounts. If everything went right, you should now be able to pick up at Step 7 and see your progress as you chip away at your FLTS. Congratulations and good luck! Don’t forget to share your success story with me in the comments.